Patchings Art Centre is currently showing a marvellous exhibition of paintings entitled 30 Artists for 30 Years in the Barn Gallery at the centre. This celebrates their 30 years in existence which grows from strength to strength every year, and is the highlight of the year in many artist’s calendar. Their Art Festival in July is the most spectacular art and craft event in the country, and I urge you to pop along and see these works by artists who have exhibited and demonstrated there over the years. You will find the centre in Oxton Road, Calverton, just north of Nottingham – the postcode is NG14 6NU. 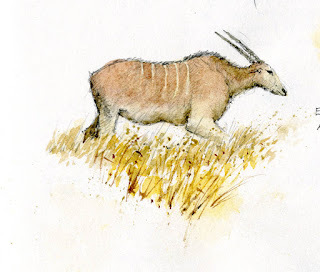 While I was in Kenya I did manage to find a little time to do a short safari to capture a few more animals and birds in my sketchbooks. In this, one of the calmer moments of my entire trip I drew an eland wandering through the grass, adding in the colour later. Much of the time though it wasn’t at all calm, what with monkeys eyeing up my cereal bar – the speed at which they hit you is awesome, and you do rather feel glad it’s a monkey and not something bigger with huge teeth; also rather nasty things lurking in the undergrowth when you go for a wander to stretch your legs……yes, wildlife is absolutely fascinating! Many thanks to all of you who sent good wishes for my recovery – it was really nice of you, and you can be assured that I’m now fully back to standard mischief-making status. 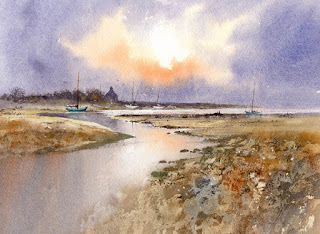 Enjoy your painting, and do come and see me at Patchings in July – it’s a great occasion! Getting the composition right is critical whatever medium you use. In landscape painting there are many rules, or guides that will help you achieve a powerful composition, although like most ‘rules’ in painting these can be broken at times in order to create more original results. It does pay, however, to follow these rules while you are learning, and then perhaps taking a more creative approach later when you gain experience. 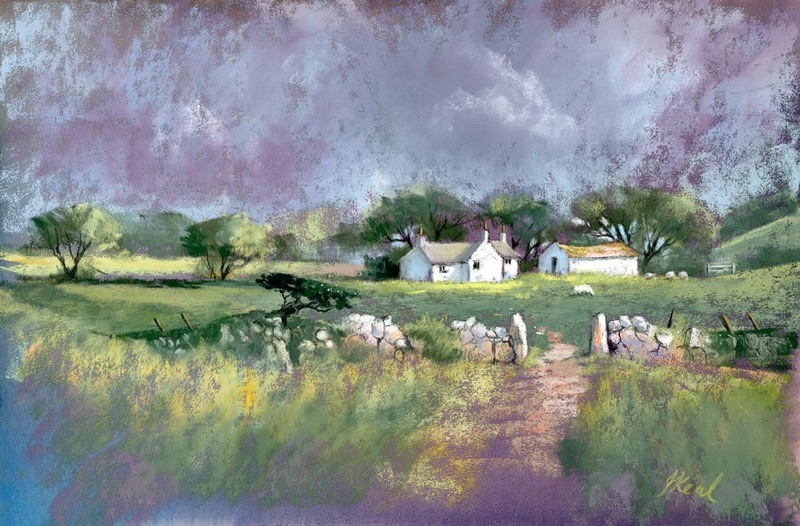 In this watercolour of Angle in Pembrokeshire I have used Waterford 300lb paper with a marvellous rough surface to enhance the textural effects, particularly in the large foreground area. The large foreground pushes back the centre of interest – the cottage – and allows a large lead-in of the creek. A lead-in to the centre of interest like this helps establish it, and the boats, birds, sparkle on the water and strong orange colour in the sky all draw attention to the centre of interest. The cottage also stands out darkly against the sky. These are all devices you can use to highlight your focal point. The far right-hand boat gives a sense of balance to the composition, so that not everything is concentrated around the centre of interest. It is a good idea to carry out one or two studio sketches to ascertain the optimum positioning and emphasis on the painting to be done. Having the centre of interest around one-third of the way down the paper, or up from the bottom, and one third of the way along from either side always gives a powerful effect, so try not to place it bang in the centre! As usual, life is so full of exciting activities that it’s hard to find time to blog, especially when I’d rather be communing with nature than with a computer. 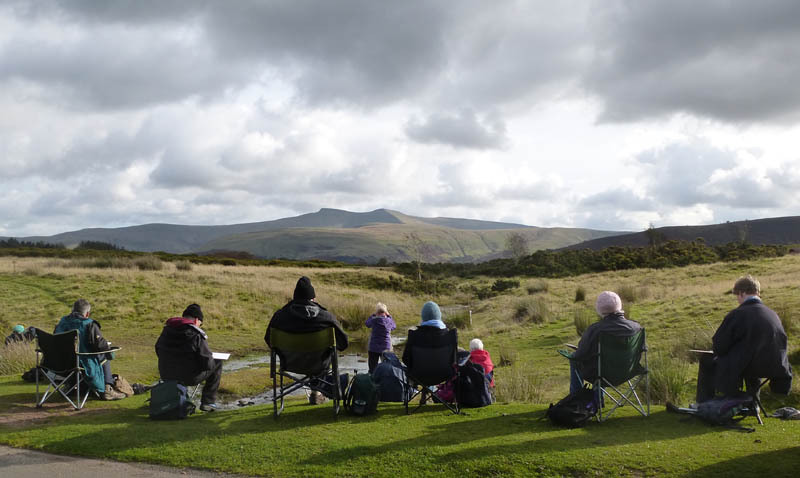 What a tremendous autumn it’s been – the combination of lots of sunshine and amazing autumnal colours has really provided some stunning images for the landscape artist. My autumn course in Mid-Wales benefited from the colours and sunshine so much that we were able to paint out of doors in October, even quite high up in the Brecon Beacons. Here the group is painting the main peaks with a stream leading nicely into the focal point. There is still a lot of colour around, so you may well find it rewarding to get out and capture those scenes. A few dabs of masking fluid can be very effective for rendering those bright-coloured individual leaves that still hang around. 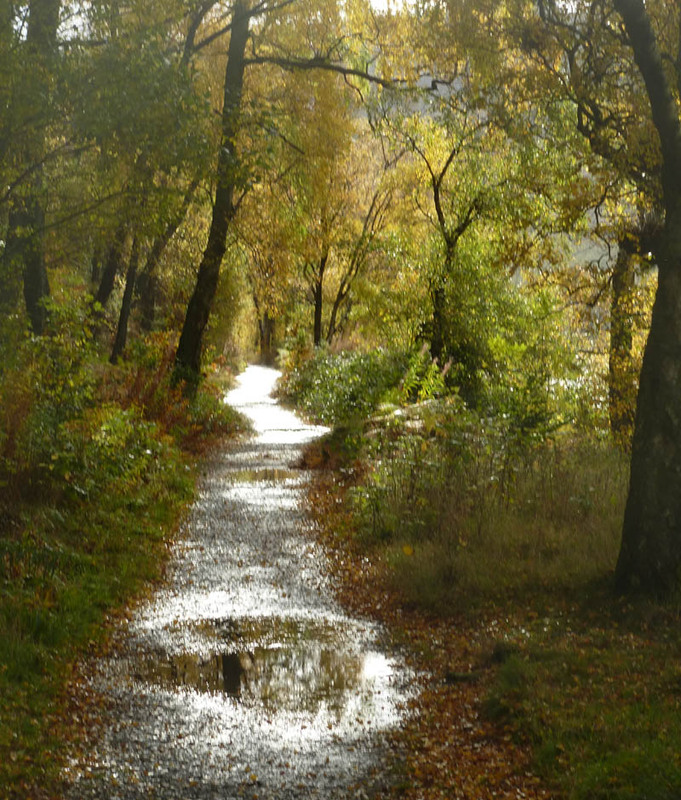 Don’t forget though, that a drop of rain can liven things up by creating puddles. These can form really useful features in a foreground, and can be introduced into a painting quite easily. They really come alive if you stand on the opposite side of the puddle to the sun, as the backlighting can create extremely bright and contrasting tones as you can see in the photograph on the right. It gets even better if you can get some of those autumn colours to reflect in the puddle, See how the light part of the puddle stands out against the darker leaves on the right-hand side, and the dark water stands out against the glistening wet surface of the path at other points. We can learn so much simply by observation like this, but it’s even better if you can manage a sketch and a photograph of the scene, as it will really drive the effect home. This weekend I had a very pleasant sojourn in the Cotswolds, invited to join in the exhibition of the Pure Watercolour Society at the Windrush Gallery situated in the delightful village of Windrush, just west of Burford. This was formerly the studio and home of James Fletcher-Watson who was passionate about traditional watercolour painting, and became the first President of the PWS in 1999. This exhibition marks James’ centenary and includes a great many of his original paintings. 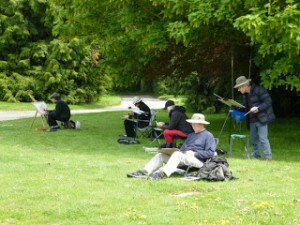 The picture shows members of the PWS hard at work in a Cotswold farmyard. We were sketching the lovely old buildings, but what caught my eye was the wonderful collection of decaying rubbish hidden behind a barn: don’t ignore those rusting old drums and bits of machinery half-hidden in the weeds. There was even an old anvil lying in the midst of it all. These little features can add so much to a painting. 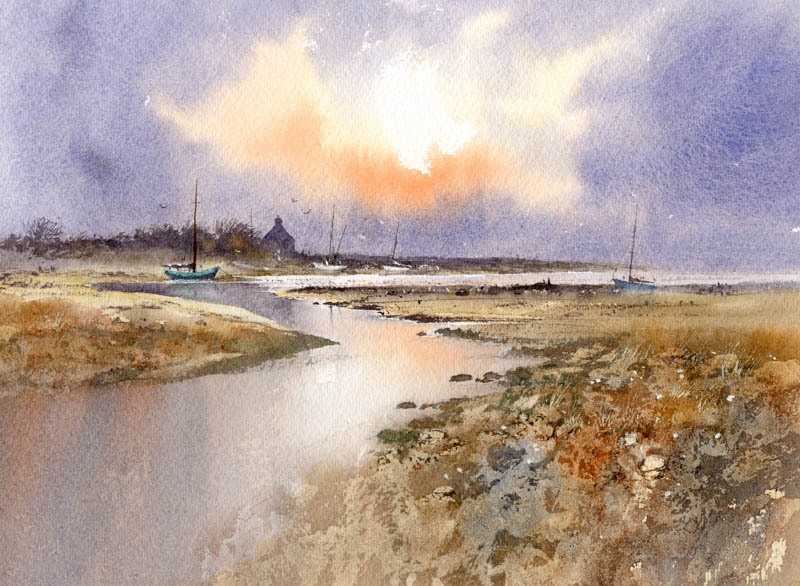 As well as James’ paintings the artists represented include David Curtis, Trevor Chamberlain, David Howell, Winston Oh, Tony Taylor, Peter Cronin, Andrew Hucklesby, John Yardley, Philip L Hobbs and Ian Piper. The exhibition continues until 28th May and is open 11 am to 5 pm daily. Tel: 01451 844425 The exhibition launches a new book commemorating James’ work, and in which several of us were privileged to include an example of our work. Try to get along and see the exhibition if you can, as it contains a wonderful variety of styles by a number of watercolour masters. David and Jenny have an exhibition at Art Matters in Tenby starting on Easter Saturday, call in and say hello if you are in the area. The western fringes of the British Isles, have always exerted a strong influence on my painting. The stories, myths and legends, the ancient stones and the marks left by prehistory are evident everywhere. The cottages and farms, hunkered down among the rocks in their struggle to survive the Atlantic fury, show clear evidence of the ingenuity of past generations. Even today, in many places, the same building methods are used to protect homes from the violence of the weather. In Pembrokeshire especially, the buildings have a unique character, that makes them a gift for the artist. Like many other painters I am bewitched by this charm. The rugged coastline provides a never-ending bounty of subjects. At every twist and turn of the shoreline another inspiring view appears. I am fortunate indeed that Pembrokeshire is David’s home county. Through his intimate knowledge of every nook and cranny we have explored fascinating and stimulating places and although we have travelled the world together, it is to Pembrokeshire that I always long to return.